Again, it is the time of year when we look back at the past 12 months. It’s not something I like doing, preferring instead to always live in the moment and look forward to the future. It’s a pity that fresh years start in January, just after Christmas. Most of us are broke after the holiday spending spree and the weather is cold and gloomy in most of the northern hemisphere. While living in London, this period was always the most difficult of the year. With very short days, it seemed like never-ending grayness until the first blackbirds announced that spring is in the offing and daffodils will soon be in flower. Although I can’t remember any one year that was exceptional – well, maybe 2007 -- I find it difficult to say the rest were all good or all bad. There are always the ups, the downs and the in-betweens. And 2010 is no different. There were some slippery slopes, but still a lot to be thankful about. The year began on a sad note. I bade farewell to my friend Lydia Georgi, with whom I worked for more than 25 years. I was able to spend four days with her in Beirut in January and was there again in February for her funeral. It’s a great shock to bid farewell to your peers and puts much of your own life into perspective. And 2010 didn’t pick up after that. With Dubai still reeling from the effects of the global recession, work has been slow and selling my flat in Dubai Marina even slower. But I am not one to dwell on the glass that is half-empty. Looking through the glass that's half-full, 2010 has been good because my family and friends are in good health, which is a blessing. And although I haven’t seen my brother Emile and his family for four years, my sister Asma and I were able to spend three weeks together in Beirut in November. Having both returned to base in Dubai and Cannes since, we can still talk and see each other and our brother through Skype on an almost daily basis. The past year has also been good in that I have met so many people in Dubai, Beirut and the rest of the world through Twitter. A lot of them are now good friends and it’s a community where we help and support each other. 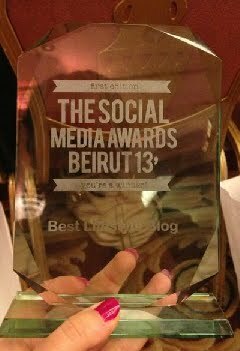 I was overwhelmed by the welcome I got in Beirut in November and by how many of my Twitter friends went out of their way to meet me. This virtual world gets more real by the day and I thank you for being there. Until something else comes along, Twitter is a wonderful and exciting extension to my days. It’s been a meeting place, a café of sorts, a school of ideas and a university on nearly every subject. I hope it survives for a while or is overtaken by a platform that is just as useful and friendly. 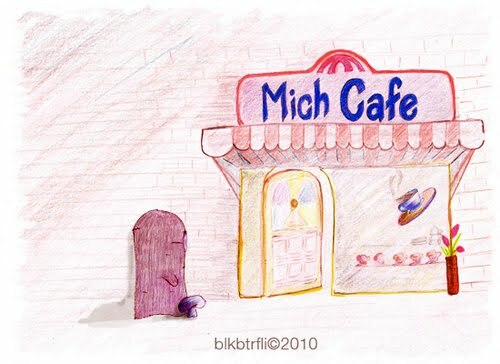 But my godsend in 2010 was to create Mich Café last July. Thanks to you, my readers, and to your encouragement and support, it has become my compass point. While apprehensive at first as to what I would write and who would read my scribbling anyway, I now enjoy writing every word that goes into this blog. I am constantly looking around for the next post and sifting through experiences, memories and albums for moments to share. It is a relentless search for subjects that sometimes mean digging deep within, hoping you will continue to share them with me. Each comment I get and each time you share my posts makes it all worthwhile. 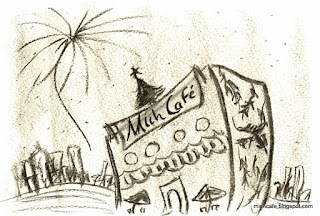 I dive into 2011 hoping Mich Café will continue to attract your time and attention. I rarely make new resolutions at this time of year, but this blog calls for an exception and I will continue to put my heart into every single post. My wish for the coming year is to land a sponsor or some advertising that will allow me to blog full-time. 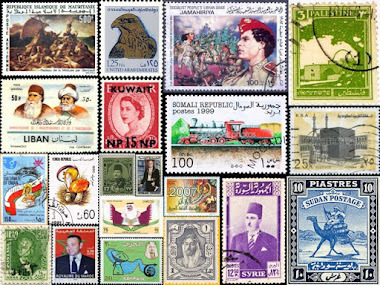 I love writing about the beautiful Middle East and the Gulf -- our culture, customs, people, foods… It’s a dream and my goal is to make it happen. I hope, come next December, to write a post saying what a great year it has been! Thank you for reading Mich Café. You, the readers, are Mich Café! I wish you good health, peace of mind, fun times, love and happiness in 2011. Let us strive to make it a year to remember. I wish all my readers a very Merry Christmas. I hope it is blessed with joy, peace, good health and all good things. Christmas Eve is always very special to me and for the past two years I celebrated with friends I met on Twitter. Last year we began a tradition of gathering all Dubai solos at our favorite fish restaurant, Bu Qtair. And so it was that Paul, Karla, Rupert, Alison, Ryan, Shahveer, Shru, Faisal, Ken, Belle, Wajiha and I met there last night. Rupert, Paul and Karla brought Christmas crackers that were soon pulled, the hats donned and confetti sent flying in all directions. Bu Qtair is very simple but serves the best fish in town. Overlooking Burj al-Arab, opposite Umm Suqeim port, it is in fact a sandpit with a hut. But the fish is fresh and succulent. We feasted on Shari and Hammour fish, spicy prawns, parathas and curry fish sauce washed down with excellent tea. Although we usually eat with our hands, our friendly waiters seemed to think the occasion called for some cutlery and we were all shocked to see two forks and two knives. Another novelty was Nasser’s shaven head and leather jacket outfit, instead of the usual net that covers his hair and white uniform… But it was Christmas Eve! Thank you all for coming and for those who missed it, you can get a feel of the place and some of the fun by joining us here. Although “location, location, location” is the magic formula and number one rule in real estate, an extra is always welcome. The garden, pool and aviaries, on top of the location, immediately had me sold on the home I now rent in Dubai. Having a friendly landlord and his convivial family is the icing on the cake. When I arrived from London four years ago, I was already missing my pet budgie and the sight of three aviaries in the garden of my new Dubai home was a boon. I have often written that it’s hard to wake up on the wrong side of the bed when the first you hear is the chirping and tweeting of all kinds of birds. For we now have two aviaries jam-packed with lovebirds and a third housing white doves. Breeding lovebirds, and now white doves, is my landlord’s hobby. While wondering around the garden with him earlier this week, Shehab Habib said he could not remember when his love for birds started. “Maybe it is through one of my uncles, who breeds them,” he said. He chose lovebirds because he admires their colors, enjoys their chirping and singing as well as their joie de vivre. Mr. Habib started out with eight lovebirds and now has more than 60. The colors were random at first, until he paired those he appreciated most and were favored by buyers, like the Red-Faced lovebird. He says these are the favorites, followed by the green and yellow and bright yellow variety. Lovebirds are so named because when kept in pairs they will constantly groom one another and sit as close together as possible when sleeping or resting. They are playful, inquisitive and an ideal pet, especially when hand-raised. Lovebirds, or Agapornis, were a largely unheard of species outside Africa until Europeans wrote about these strange brightly colored birds they had seen while on that continent. The first Lovebird to be described in detail was the Red-Face in early 1600. It was also the first to be imported into Europe during the 19th century since it was found more commonly in the wild than any of the other species. It is hard to tell the male from the female lovebird, and Mr. Habib says the pairing is often haphazard and can result in some astounding colors. But he now has an eye for telling them apart. Our garden lovebirds are chirpy, especially at dawn and at dusk. They weren’t too scared when I went into their homes to take pictures and settled after a while and ignored me. The nesting boxes had baby birds, but I didn’t want to disturb them. It seems they are sought-after Christmas presents and I hope those who offer them realize that a pet is for life and not just for Christmas week. Mr. Habib says the cheapest place to buy them is in Sharjah, where a pair is sold for about AED 250 ($ 68). On Dubai’s Jumeirah Beach Road, however, a pair can leave you AED 800 ($ 217.80) out-of-pocket. The white doves are a more recent addition to the garden. Mr. Habib secured them from his uncle. We now have three pairs and two young ones, called “squabs.” Doves lay two eggs that hatch after about 14 days. Both sexes incubate them and have a nutritious milk to feed to the young who stay in the nest for nearly four weeks. I am now monitoring their growth and looking forward to watching them fly around the aviary. And the family grows with two other squabs on the way. Although these doves are a special meaty variety coveted as a delicacy by restaurants and individuals, none of ours have been sold for that purpose so far. The white dove, with an olive branch in its beak, is a symbol of peace and love. Genesis recounts how Noah let a white dove out from the Ark to see if there was any land left after the Flood. The dove came back with an olive branch. When he released it seven days later, the dove did not return, proving to Noah that it had nested. Soon after, Noah and the rest of the animals touched land. Both the lovebirds and the white doves tolerate the Dubai harsh and long summers and are thriving in Mr. Habib’s care as you can see from the pictures here.